Lately, I've been researching the life of Pitt's friend and fellow politician Henry Addington, 1st Viscount Sidmouth (1757-1844). As part of my wanderings, I decided to visit his grave at St. Mary the Virgin in Mortlake near Richmond, London. Sidmouth was by far the longest-lived of all Pitt's friends - dying in February 1844 at the ripe old age of 86. He was the son of William Pitt's father's physician, Dr. Anthony Addington, and thus he was acquainted with Pitt from a formative age. Just two years older than Pitt, he was encouraged by him to take a more active role in politics. In 1789, Addington became Speaker of the House of Commons on Pitt's behest, and he served in that capacity until 1801 when he took over the office of First Lord of the Treasury and Chancellor of the Exchequer. He was Pitt's nominated successor when Pitt resigned in February 1801, and he filled the office of Prime Minister until May 1804, when Pitt returned to office for the second and final time. Henry Addington was raised to the peerage in 1805, becoming the 1st Viscount Sidmouth. He later served as President of the Council and Home Secretary. 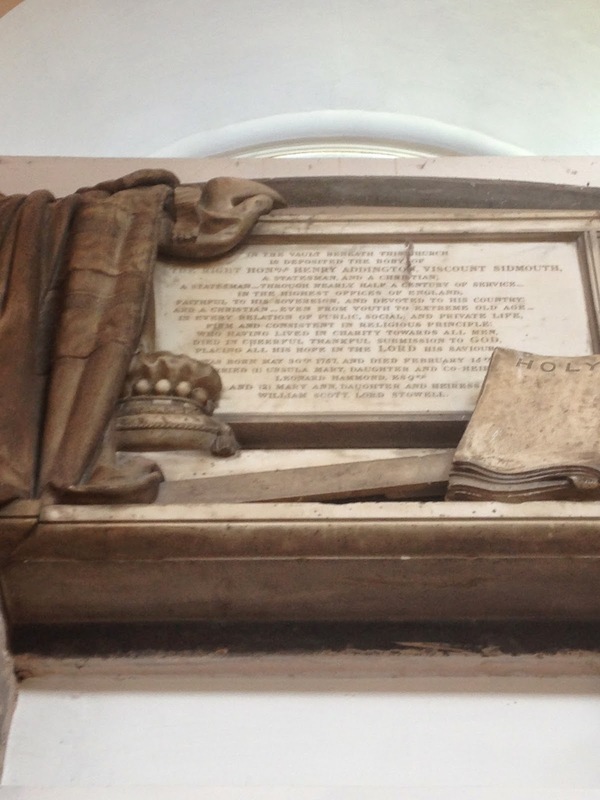 The memorial plaque dedicated to Henry Addington, Viscount Sidmouth is inside the church. 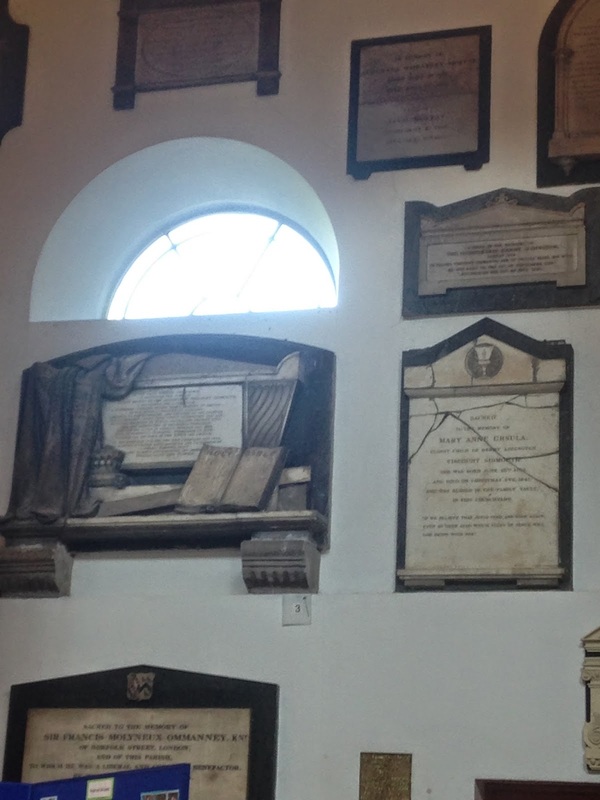 Like many other churches, it has undergone some changes over the centuries, including moving memorial plaques to different locations. Apart from the Tudor bell tower, the rest of St. Mary the Virgin, Mortlake, dates from the early twentieth century. 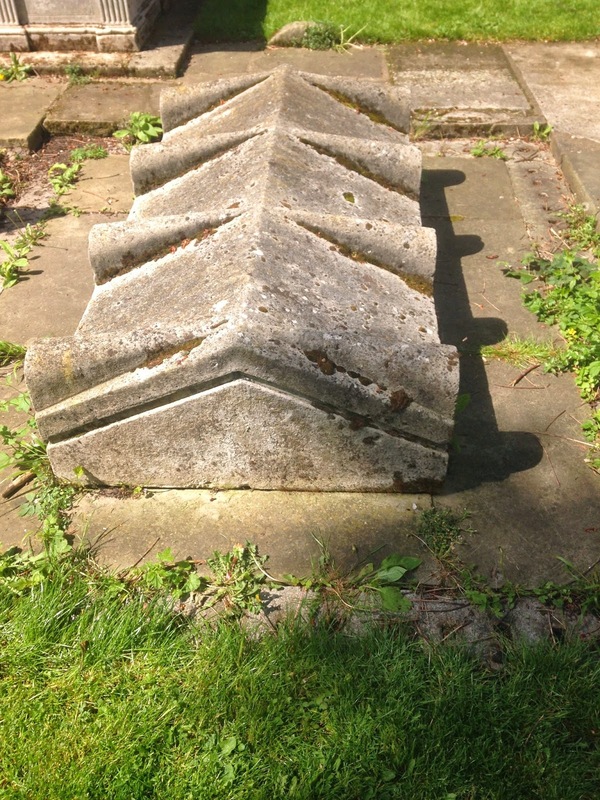 "In the vault beneath this church is deposited the body of the Right Honourable Henry Addington, Viscount Sidmouth. A statesman and a Christian. A statesman through nearly half a century of service in the highest offices of England. Faithful to his Sovereign and devoted to his country, and a Christian even from youth to extreme old age in every relation of public, social, and private life. Firm and consistent in religious principle, who having lived in charity towards all men, died in cheerful, thankful submission to God, placing all his hope in the Lord, his Saviour. He was born May 30, 1757, and died February 15, 1844. Buried one Ursula Mary, daughter and co-heiress of Leonard Hammond, Esq., and two Mary Anne, daughter and heiress, William Scott, Lord Stowell." It is evident from the inscription on the memorial plaque that Sidmouth was buried inside the church, and not in the Sidmouth Tomb in the churchyard. 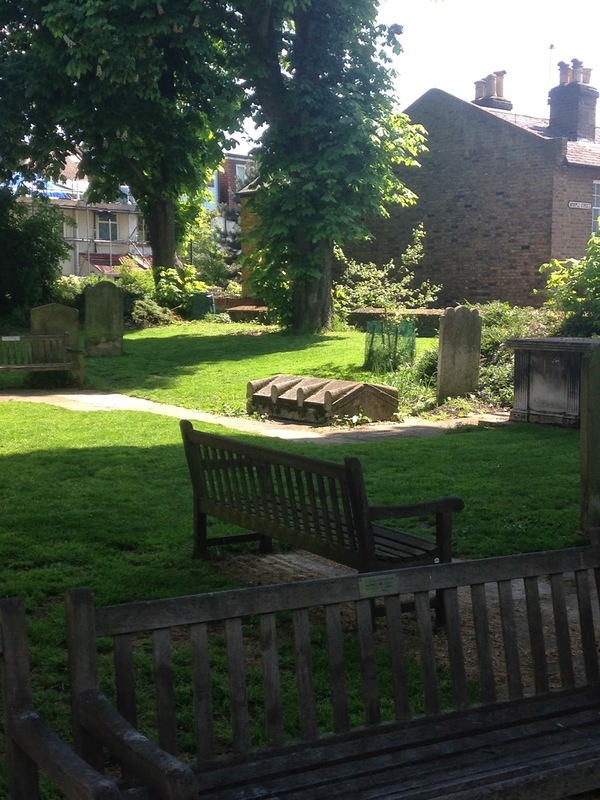 The exact location of his burial place is impossible to determine, especially given all the architectural changes that have taken place in the church. 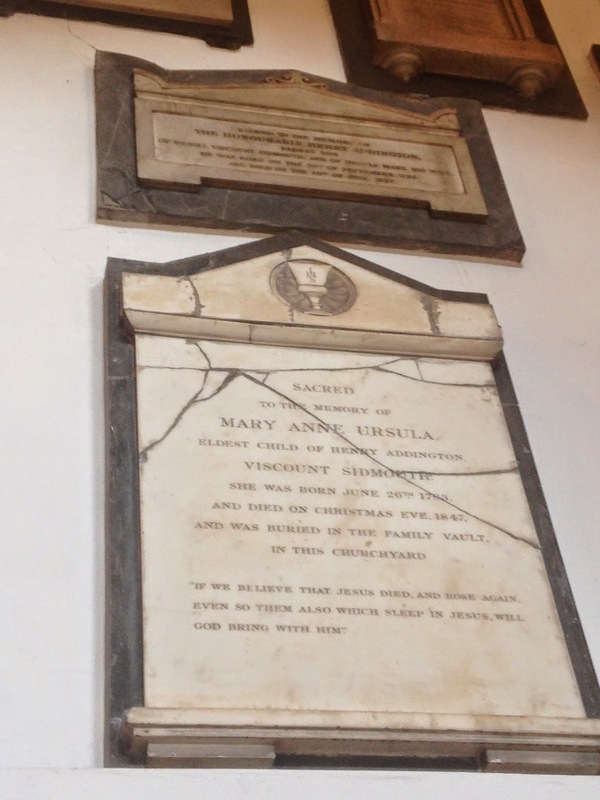 Of interest, The Sidmouth Tomb in the churchyard was constructed for the burial of Addington's first wife Ursula Mary in 1811. It originally had iron railings around it, but they were removed during the Second World War as part of the war effort. There are also two additional memorial plaques dedicated to members of the Addington family. One is for Henry Addington's eldest son, the Right Honourable Henry, and the other is to the memory of Addington's eldest child Mary Anne Ursula. There's surely an error in the transcription given above of the Sidmouth plaque - for 'buried' it surely should read 'married'? Thanks all the same for the interesting information re an unjustly neglected statesman.